The opposite of earned success is “learned helplessness,” a term coined by Martin Seligman, the eminent psychologist at the University of Pennsylvania. It refers to what happens if rewards and punishments are not tied to merit: People simply give up and stop trying to succeed. All surveys show that most Americans still embrace our free enterprise system—today. The crucial test is whether the country is willing to support the hard work and policy reforms that will sustain it. The cost of failing this test will be more human than financial. In our hands is the earned success—and thus the happiness—of our children and grandchildren. The stakes in the current policy battles today are not just economic. They are moral. Second quarter GDP growth was slow to begin with, and has now been revised to even slower (1.3% vs. 1.7%). That's a relatively modest downgrade (the number is annualized, so the downward revision to the level of GDP was only about 0.1%), but it's pretty slow growth, both in real and in nominal terms. Since the U.S. economy has enjoyed an annualized growth rate of 3% or so for over 50 years leading up to the last recession, the current recovery is downright miserable. By my calculations, the economy is about 12% smaller than it should be. If the economy were growing at its long-term trend, national income would be about $2.1 trillion higher than it is today. That's a lot of lost jobs and lost tax revenue. Weak growth is thus the principle source of our ongoing $1 trillion plus annual deficits. Despite all the disappointing news, though, it's nothing that the market hasn't expected, and that is an important thing to note. Abysmally low Treasury yields are symptomatic of a market that expects very weak growth for as far as the eye can see, and by the looks of these charts, we're on track for exactly that. I look at the above chart, in contrast, and argue that it is no longer meaningful to compare corporate profits to our domestic economy at a time when the U.S. economy is more integrated than ever before with a global economy that is growing quite rapidly (e.g., China and India). When you compare corporate profits to global GDP, the current level is unremarkable and therefore sustainable. Consequently. it seems reasonable to conclude that the market is very pessimistic and therefore valuations are quite attractive. Assuming, of course, that we are not on the cusp of another substantial recession. I think that even a continuation of today's disappointingly slow growth could be enough to move equity prices higher—the market can only ignore record profits for so long. As long as we avoid a recession, the market is likely to move higher, albeit modestly. Should we get a meaningful pickup in growth next year, however, then Katie bar the door. If capital goods orders are a good proxy for businesses' confidence in the future, then the outlook for future growth is not very promising. 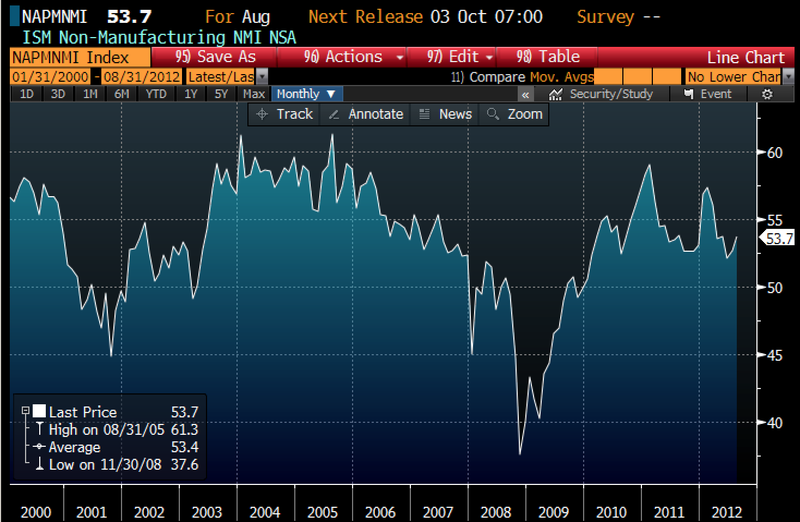 This chart is just about the only one I follow that paints a clear picture of a slowdown. Some argue that the decline in capex this year is payback for the expiration of favorable tax treatment this year, but I note that the weakness has only been noticeable in the past three months (June-August). This lends support to those who argue that business investment has declined because businesses are losing confidence in the future, and that the looming fiscal cliff at the end of this year likely has been the catalyst for mounting concern. Whatever the case, declining business investment means less growth in the future—because investment is the seed corn of future productivity gains. I would add that this somewhat gloomy investment outlook confirms the message of 1.6% 10-yr Treasury yields: the market's collective wisdom calls for very slow growth for the foreseeable future. Pessimism still trumps optimism in today's market. As the top chart shows, the 4-week moving average of weekly claims for unemployment is 374K, and that is also the average of this series so far this year. As the second chart (of unadjusted claims) shows, claims are still in a downtrend, with current claims running about 8-9% below those of the prior year. So although claims have been flat so far this year, there is reason to think they will exhibit a decline as the year progresses. That adds up to modest, but continuing improvement in labor market conditions on the margin. 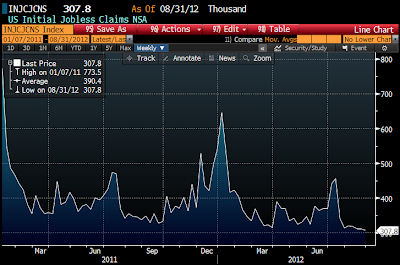 The number of people receiving unemployment insurance continues to decline, down 19.8% from a year ago. Today, 1.25 million fewer people are receiving unemployment checks than were a year ago. That adds up to a significant change in the margin, and the trend looks to be accelerating, if anything. No sign here of any emerging recession, none at all. It's steady and slow as she goes. This chart of the yield on current coupon FNMA collateral and 10-yr Treasury yields, and the spread between the two, is good evidence that the Fed has finally managed to distort market pricing. 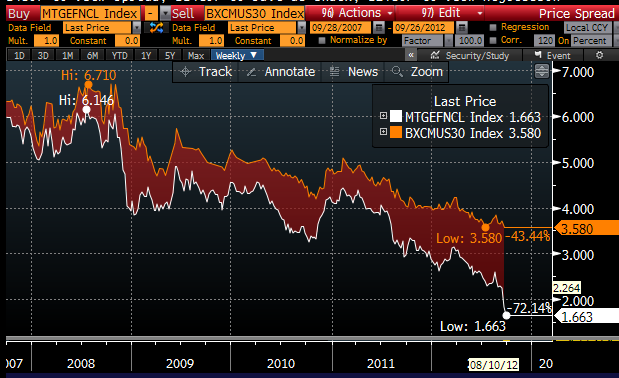 MBS spreads are now almost zero—implying that FNMA MBS are as rock-solid and as attractive as Treasuries. Which of course they aren't. Mortgage-backed securities have nasty characteristics that Treasuries don't: when yields fall, their duration shortens (because homeowners can prepay their mortgages), and when yields rise, their duration extends (nobody will ever want to prepay a 30-yr mortgage with a 3% rate). That's called negative convexity, and that's one big reason why MBS yields are almost always higher than Treasury yields. Investors require an extra yield on MBS to compensate for their erratic cash flow risk. Not to mention, of course, that they don't have an explicit U.S. government guarantee. If MBS spreads remain near zero, then 30-yr fixed rate conforming mortgages (orange line in the first chart above) could fall to 2.25%. (Over the past 15 years, the average spread between FNMA collateral and 30-yr conforming mortgages has been about 60 bps, which when added to today's 10-yr yield of 1.62%, gives you an idea of just how low conforming mortgage rates could go.) At that outstanding, almost unimaginable level, everyone who doesn't own a home should be willing to stand in line outside a bank for however long it takes to qualify for a mortgage, and then turn around and buy just about any home on the market. The Fed has succeeded in creating the housing market's biggest "blue plate special" of all time. Come and get it! A once in a lifetime opportunity to lock up unbelievably low fixed-rate financing and buy a home at a price that's not going to last much longer. The one thing standing in the way of what should be a stampede of new home buyers is that it's not so easy to qualify for a loan. Banks have been loaded to the gills with reserves, and thus able to make an almost unlimited number of new loans, but they haven't—because they are still very risk-averse. You need 20% down to qualify, and your credit scores need to be good, and your employment solid. Not everyone can qualify, and many can't. Regardless, this is a situation that can't last for very long. When market prices are distorted artificially, powerful arbitrage forces are set in motion. Large institutional investors are going to want to sell their MBS holdings at what could be record-setting high prices. 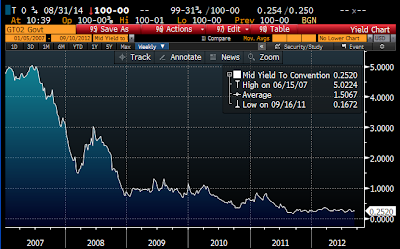 Yields going forward are paltry, downside risk is enormous, and upside potential is extremely limited. The Fed's promise to buy $40 billion per month of MBS could be swamped by the decision of money managers to lighten up on their MBS holdings, which are measured in the many trillions of dollars. In other words, the big decline in MBS yields could quickly reverse, because the Fed can't permanently distort the yield on a market that is many trillions of dollars in size by buying a paltry $40 billion per month. And of course, banks are at some point going to be relaxing their lending standards. If they don't do it on their own initiative, then you can bet some politician is going to figure out a way to force them to. There is a precedent for this sort of thing in the U.S., after all, and that's one reason we got the housing market bubble. Came back from a trip last night (that's why blogging has been somewhat light) and found my new iPhone 5 waiting for me. 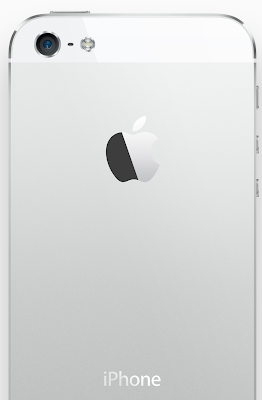 First overwhelming impression: it's so light! Actually, it's 20% lighter than the 4S, even though its screen is bigger. Nevertheless, it feels just as solid. Next thought: this phone is gorgeous. The design has been purified; it's hard to see how it could be better. Could a future phone be any lighter or more compact? Hard to believe; what will they do to improve on this? It's faster all around. The camera takes much better pictures in low light (the biggest defect with previous iPhones was lousy indoor shots). The screen is perfect. I love the new charger plug; the other one looked clunky, this one looks svelte, just like the phone. I think anyone who picks up this phone and compares it to any other on the market will be immediately smitten by its looks, its simplicity, and its functionality. No other screen can compare. The software "just works," and everything is smoothly integrated. iCloud syncs everything hassle-free. How can so much technology be packaged into such a small and beautiful enclosure? Apple is going to sell this phone as fast as they can make them. It's going to be another blockbuster. Full disclosure: I remain long AAPL at the time of this writing. The Radar Logic series of housing prices (nsa) is up 3.7% in the year ending July, and it is essentially unchanged for the past three years. The Case Shiller measure of housing prices (sa) is up 1.1% over the past year, and hasn't changed much either over the past several years. That's three years of almost flat prices, with the important change on the margin being to strengthen, albeit modestly. For over six years the housing market has been adjusting, painfully, to new realities, and increasingly it appears that the adjustment process is complete. Prices have found a new equilibrium. Using the Case Shiller data for 10 large metropolitan areas, and comparing that to the BLS' calculation of owner's equivalent rent, we get the same story: housing prices and rents have come back into alignment; the adjustment process is largely complete. However, the current level of prices may not be a true equilibrium, because mortgage rates, which determine the "cost" of a house for many people, are extraordinarily low. If getting a mortgage were to be made somewhat easier (it's still difficult, as my daughter can attest), demand for housing could increase significantly, boosting prices even as banks increased their sales of foreclosed properties. Even now there are bidding wars in some markets, and some houses in my daughter's neighborhood are selling for full price just one or two days after listing. In a world in which 98% of the conversations are about cost containment, it's a joy ... to have somebody who's focused on enhancing quality only. ... the health-care delivery system, to the extent it qualifies as a system, "has no quality control, no integration, no coordination." Doctors "tend to operate in an independent and isolated way, and even specialists who've been treating the same patient for years and years typically never, ever speak to one another." Since businesses are the customers [in the current system], not the individuals who change jobs every three years on average, insurers "act rationally" and don't invest in services with "short-term costs and long-term payback." ... the better option is for businesses to convert to cash vouchers so their workers can buy portable policies. Right now, there is "no meaningful information about the quality of care, virtually no information about price, and no sensitivity to price," but that would change if the insurance industry built "an enduring relationship with consumers ... "
... why, circa 2012, should HR departments be selecting and administering one or two or three plans for a thousand or a hundred thousand workers and their dependents? You don't need a Ph.D. in economics to understand that you will guarantee suboptimization." Universal coverage is never as universal as its proponents want it to be, and it usually results in a double- or triple-tier system as the upper-middle classes flee. Then the medical ethicists condemn the disparities based on ability to pay that their own programs helped to create. ... if your aspiration is to provide everyone the highest quality of care, then you have precluded yourself from providing anyone with the highest quality of care. As an economic, structural, societal matter, it's impossible to achieve. "Innovations such as ours have to start at the high end, because you have to figure out how to do it. And then you figure out how to systemize it and take the costs down and deliver to the mass market." Americans ... are "extremely good at buying things." But they don't know how to buy health care ... . "The entire engine of American consumerism is missing in health care. What a preposterous thing." The last two sentences are the most powerful. And by the way, the guy who is doing this is a Democrat. Amid sluggish growth that has prompted the Federal Reserve into unlimited monetary easing, it is hard to imagine a worse time to raise the tax on capital investment. None other than Lord Keynes wrote that "the weakness of the inducement to invest has been at all times the key to the economic problem." First, under current tax rules, all gains from investments are fully taxed, but all losses are not fully deductible. This asymmetry is a disincentive to take risks. A lower tax rate helps to compensate for not being able to write-off capital losses. Second, capital gains aren't adjusted for inflation, so the gains from a dollar invested in an enterprise over a long period of time are partly real and partly inflationary. Third, since the U.S. also taxes businesses on profits when they are earned, the tax on the sale of a stock or a business is a double tax on the income of that business. The main reason to tax capital investment at low rates is to encourage saving and investment. First-time claims for unemployment have averaged (on a seasonally adjusted basis) 375K per week this year, and the latest tally was 382K. 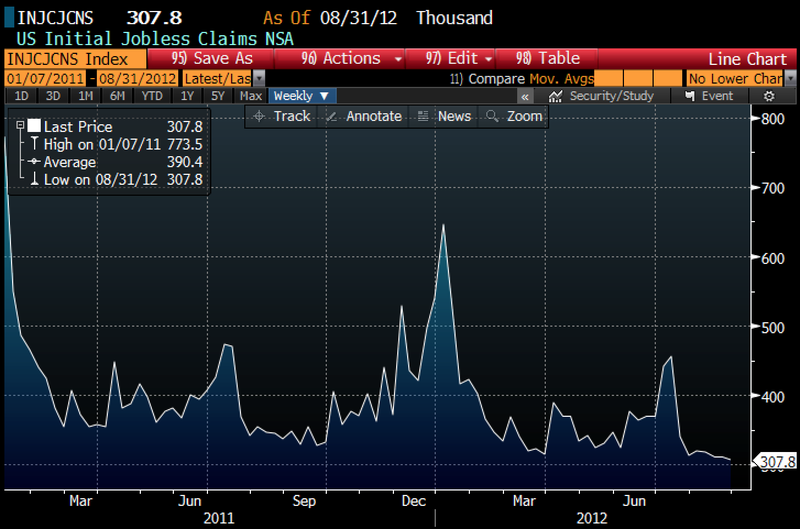 The bottom line is that claims have been flat this year. No signs of any deterioration in the labor market, and no signs of any meaningful improvement either. The outlook for the economy remains rather dull and uninspiring. 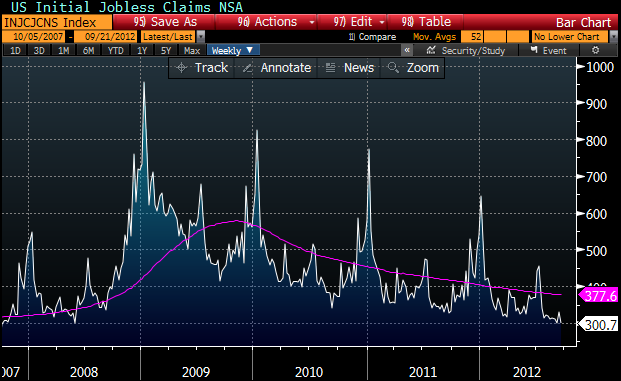 What has changed meaningfully, however, is the number of people receiving unemployment insurance. Over two million people have dropped off the dole so far this year. Since the ranks of the employed have increased only by 1.1 million this year, that means there are an additional one million people out there not working and not receiving unemployment compensation. Presumably, those folks are increasingly eager to get back to work. I count that as a positive change on the margin, since it means that employers ought to find it easier to hire people. The one ingredient that is missing, of course, is more employers willing to hire people. The problem is not that the economy is losing jobs, it is that the economy is not creating enough. That's the sort of thing that can only be addressed by fiscal policy. The Fed pumping more reserves into a banking system that is already sitting on $1.5 trillion of excess reserves is not going to create more jobs. If the additional reserves are going to make a difference, banks have to decide that they are going to deploy those reserves; they need to lower their lending standards and seek out borrowers more aggressively. By the same token, borrowers need to be more willing to borrow. For both of those things to happen, we need more confidence in the future. That in turn must come from fiscal policy, which must somehow avoid the looming "fiscal cliff," and avoid raising marginal tax rates on those who are most able to create jobs (if you increase taxes on job creators, you are very likely to get fewer new jobs as a result). In the meantime, the economy looks like it continues to grow slowly. That's disappointing, but it's a whole lot better than an economy that is slipping into another recession. Holding on to cash—there is a whopping $6.4 trillion sitting in bank savings deposits earning nothing—only makes sense if there is another recession around the corner; so every day that we avoid another recession is another day that holding cash becomes embarrassing. The Fed is trying very hard to encourage people to take on additional risk—to leave the comfort of cash by spending it or by investing in something, or to take on additional debt. So far they haven't been very successful, but the passage of time has. The longer we go without another recession, the more people are going to be encouraged to leave the comfort of cash and take on more risk. So even though there is disappointment to be found in many areas, the economy is still likely to slowly improve. That's a good reason to reduce your cash holdings in favor of just about anything else (except Treasuries, where yields are so low that it would take an outright and painful recession to push them lower). 2-yr swap spreads have declined dramatically this year, and that's an excellent indication that the Eurozone financial system is once again liquid and healthy. This in turn is a good sign that the Eurozone economy is likely to be improving in coming months (i.e., swap spreads are good leading indicators of financial and economic health). We can't say that the Eurozone is out of the woods yet, since more than a few countries have yet to address their fundamental problem: excessive public sector bloat and chronic deficits. But with the health of the financial markets restored, there is hope that fundamental reform is in the offing. The Euro Stoxx index is up over 20% since early June, another early sign that things are starting to improve on the margin. I note that with this index is trading at about 10 times expected earnings, it is fair to say that Eurozone markets are still suffering from deep pessimism. As in the U.S., the Eurozone equity market is being driven not by optimism, but by a slow decline in pessimism; conditions have not turned out to be as bad as the market had feared. The National Association of Home Builders asks its members to gauge their perceptions of current single family home sales and sales expectations for the next six months, and to rate traffic of prospective buyers. Scores from each component are then used to calculate a seasonally adjusted index where any number over 50 indicates that more builders view conditions as good than poor. The index is still under 50, so the majority of home builders still see poor conditions, but at the rate things are improving, we could see a majority rating conditions as good in a few months. This next chart shows an index of the stocks of major home builders, and it confirms that things have improved noticeably of late. The S&P 500 Homebuilders ETF (XHB) has doubled since its low of last October. Everyone should read today's WSJ op-ed by Shultz, Boskin, Cogan, Meltzer and Taylor: "The Magnitude of the Mess We're In." To their credit, they make no attempt to pin the blame for the mess on any party or politician. It should be clear that this is a bi-partisan mess we're in, and the Fed, presumably independent, is potentially a big part of the problem. It's just the facts, ma'am. The fixes are blindingly obvious. Economic theory, empirical studies and historical experience teach that the solutions are the lowest possible tax rates on the broadest base, sufficient to fund the necessary functions of government on balance over the business cycle; sound monetary policy; trade liberalization; spending control and entitlement reform; and regulatory, litigation and education reform. Both parties need to know this. A friend asked me how it was possible for the market to be near all-time highs when the problems, as described in the article, are so big, so obvious and so potentially disruptive. My answer included the chart below. If the market is at all optimistic, it would be to the extent that it is not yet priced to death and destruction. The market assumes that somehow we will avoid a calamity. There is still time to fix things, and I would agree. As a follow up to my post yesterday, the chart below provides strong support for my belief that equities are responding more to inflation expectations than they are to real growth expectations. That is consistent with the monetarist view that the Fed has very little control over real growth—you can't print your way to prosperity. The chart compares the S&P 500 to the market's forward-looking inflation expectations, the 5-yr, 5-yr forward implied inflation rate embedded in TIPS and Treasury prices. Equities benefit from QE3 because it is likely to boost nominal GDP growth, but not necessarily real growth. Inflation is now much more likely than deflation, and future cash flows are likely to be better than expected. This is all good news for now, but lurking in the shadows is the issue of how the Fed is going to reverse its quantitative easing in the future, and whether they can do it in a timely fashion to avoid inflation going too high. Meanwhile, it's good to see Treasury bond yields and equities on the rise. Higher yields are symptomatic of an improved outlook. The August budget numbers continue to show that tax revenues are rising much faster than spending. Over the past three years, federal government spending has risen at a very modest 1.6% annualized rate, although it has picked up a bit of late: over the past six months, spending has increased at a 5.2% annualized rate. But overall, the slow pace of spending growth in recent years is a godsend, as it has allowed government spending as a % of GDP to decline from 25.2% of GDP to now "only" 23.5%. Spending is still too high, and threatens to rise further as Obamacare kicks in and entitlement programs continue to expand. Tax revenues, on the other had, are up 5.3% over the past year and have risen at a 4% annualized pace over the past three years. If these trends continue, the budget will eventually balance and spending will shrink to an acceptable level relative to GDP. To date, the deficit over the past 12 months has been $1.26 trillion, which is down from a high of $1.48 trillion in early 2010. Thank goodness for small favors. The number of people "on the dole" continues to decline, and that is also a good thing from a macro perspective. 18.4% fewer people are receiving unemployment insurance today than there were one year ago. This is helping to moderate federal spending, and it is creating positive incentives to find and accept jobs. I didn't think they would do it (QE3), but they did. It wasn't necessary, but I presume that the FOMC was under tremendous political pressure to "do something!" So the Fed will be buying $40 billion of MBS per month for the foreseeable future, and they will also continue "Operation Twist." Their objective is to stimulate the economy, primarily by artificially suppressing mortgage rates, which in turn they hope will stimulate the housing market and thus contribute to a stronger economy. Unfortunately, to judge by key market-based indicators, all they have achieved so far is to stimulate inflation expectations. The chart above shows 10-yr Treasury yields (the main reference point for mortgage rates) in orange, and the yield on current coupon Fannie Mae collateral (the benchmark yield for mortgage rates) in white. 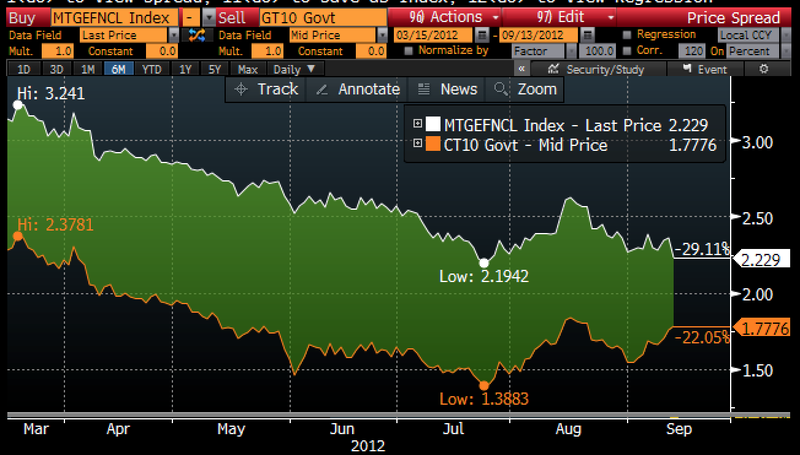 In the past two months, Treasury yields have risen while mortgage yields have not fallen. The spread has narrowed in favor of mortgage rates, but the level of mortgage yields has not changed. 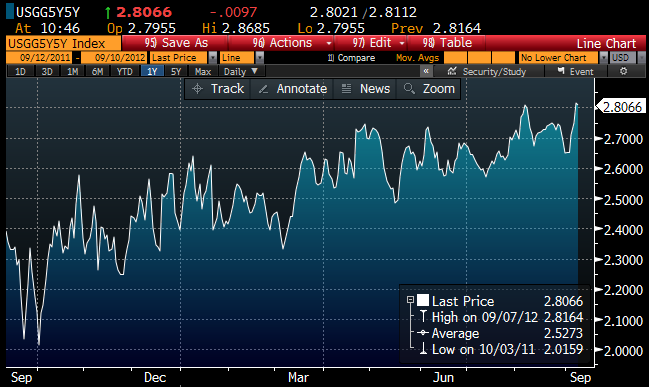 If inflation expectations continue to increase, Treasury yields and mortgage rates will rise. The Fed can't stimulate without causing Treasury yields to rise, and if they rise further, mortgage rates will have no choice but to rise as well. Rising mortgage rates will be an excellent indicator that the Fed has succeeded in stimulating the housing market. Rates could rise by a lot before they became a burden on the housing market. The chart above shows the market's forward-looking inflation expectation (i.e., the expected average annual inflation rate over the 5-yr period beginning five years from now). This has now reached 2.85%, up from a low of 2.0% a year ago. 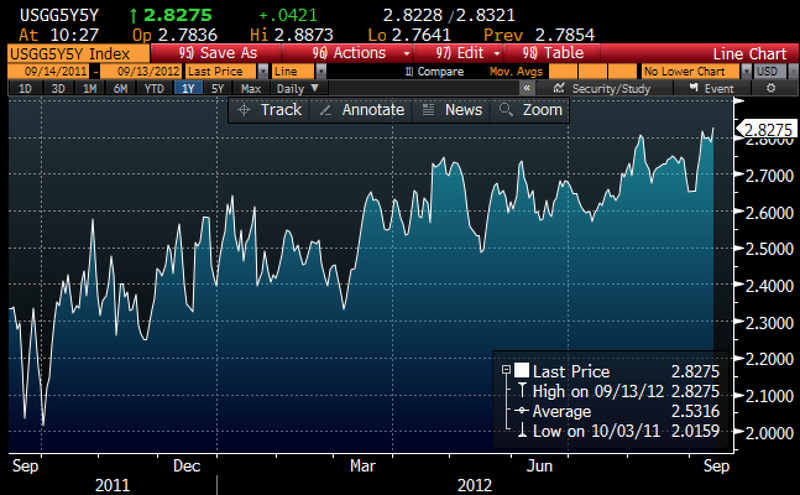 This same result (higher inflation expectations) can be observed in the spread between 10-yr TIPS and 10-yr Treasuries. The average annual expected rate of inflation over the next 10 years is now 2.48%. Not unusually high, but it's clear that the market is figuring that QE3 increases the odds of higher inflation in the future. Not dangerously higher inflation, but the risks of deflation have now almost vanished, and that is presumably a good thing. 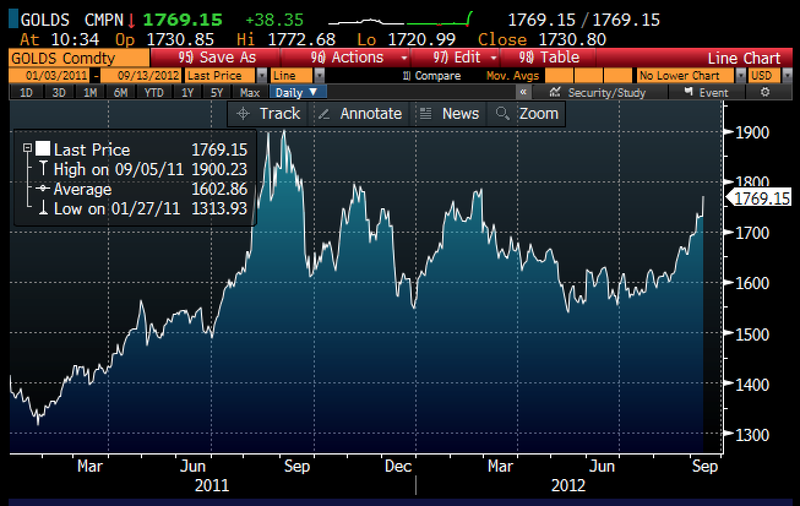 The gold market is also treating the Fed's move as a signal for higher inflation. How about the stock market—is it discounting stronger growth, or higher inflation? That's a tough question to answer, but my reading of the market tea leaves suggests that the stock market views QE3 as a sign of stronger nominal growth: businesses are more likely to see improvement in their cash flows in coming years. Whether than improvement comes from more inflation or more growth or both, matters little at this point. Stronger nominal growth means less likelihood of defaults, better profits on average (at least in nominal terms), and less risk of a recession or depression. On balance, the odds have shifted in favor of those who have a claim on future corporate cash flows, so stocks look more attractive. I don't think the market is yet discounting stronger real growth. Let's get nominal growth up and then we'll worry about how much of that increased nominal growth is real and how much is inflation. I worry more about the risk that the Fed has made an exit strategy from QE more difficult, and thus I worry more about inflation rising in the years ahead. But so far, those fears are somewhat offset by a reduced risk of recession and/or deflation. It's unfortunate the Fed had to come to this, but it's premature to say it's the end of the world. Regardless, inflation hedges just became more attractive. 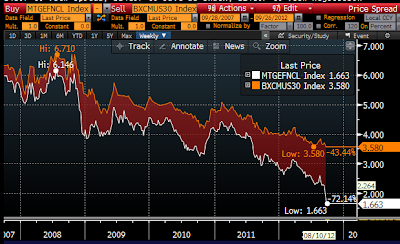 Seems to me that the cheapest inflation hedge right now is real estate, while the most expensive asset is Treasuries. So: buying real estate using 30-yr fixed mortgage debt (equivalent to shorting Treasuries) looks like an incredibly attractive proposition. With the banking system set to accumulate even more excess reserves, it seems inevitable that banks will want to increase their lending. At the same time, the demand for inflation hedges like real estate should be picking up, and with it the demand for more lending and thus more monetary expansion. Whether this will be good for the economy or just good for the real estate market and inflation hedges in general is a question that will be answered in the next year or two. For now it looks like inflation hedges are the better bet. 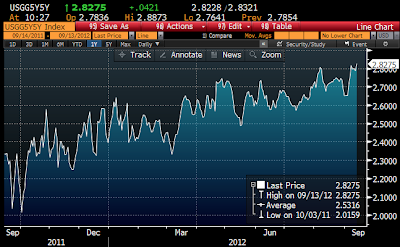 This chart shows the yield on 2-yr Treasuries, currently 0.25%. It's about as low as it's ever been, and that means that the bond market holds out very little hope for any meaningful growth in the U.S. economy for the next several years. To understand why that is the case, consider simply that the 2-yr Treasury yield is equivalent to the market's expectation for what the Federal funds rate—currently 0.16%—will average over the next two years. Market arbitrage ensures that this is so, because investors on average must be indifferent to holding cash at an overnight rate for the next two years (earning whatever the Fed funds rate adds up to), or investing in a 2-yr Treasury note and locking in the current rate for the next two years. The 5-yr, 5-yr forward implied inflation expectation embedded in TIPS and Treasury prices has reached 2.8%, up from 2.0% about one year ago. In other words, the bond market believes the economy will remain very weak despite more quantitative easing, and that inflation will tend to rise nonetheless. The bond market vigilantes are saying that more Fed ease won't help the economy, but it could hurt via higher inflation. 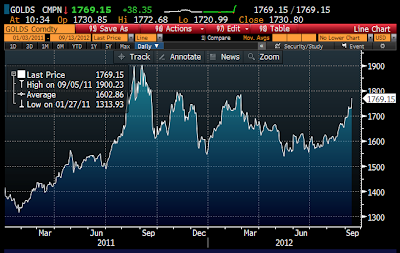 The gold market agrees, having sent gold prices up 8% in the past few weeks. All of this should give the Fed pause. We already have $1.5 trillion of excess reserves; adding more won't make the economy stronger. The Koch brothers are routinely vilified by the left, but they are shining examples of how hard work and informed risk taking have made the U.S. a rich and prosperous nation. They didn't build an empire by being stupid, and they didn't build it by cozying up to government; on the contrary, they built it themselves. Some years ago I had the great privilege of visiting Koch Industries' headquarters, improbably located in the middle of a corn field outside of Wichita. After spending two hours matching wits with some senior finance people, I came away inspired. This was one of the most intense and gratifying meetings of my career, mainly because the competitive energies of this dynamic organization were palpable, and the people were driven to excel. I've been in similar situations in numerous large corporations in my life, and these folks ranked among the very best I've encountered. Businesses have failed to make the case that government policy—not business greed—has caused many of our current problems. To understand the dreadful condition of our economy, look no further than mandates such as the Fannie Mae and Freddie Mac "affordable housing" quotas, directives such as the Community Reinvestment Act, and the Federal Reserve's artificial, below-market interest-rate policy. The role of business is to provide products and services that make people's lives better—while using fewer resources—and to act lawfully and with integrity. Businesses that do this through voluntary exchanges not only benefit through increased profits, they bring better and more competitively priced goods and services to market. This creates a win-win situation for customers and companies alike. Trouble begins whenever businesses take their eyes off the needs and wants of consumers—and instead cast longing glances on government and the favors it can bestow. When currying favor with Washington is seen as a much easier way to make money, businesses inevitably begin to compete with rivals in securing government largess, rather than in winning customers. To end cronyism we must end government's ability to dole out favors and rig the market. Far too many well-connected businesses are feeding at the federal trough. By addressing corporate welfare as well as other forms of welfare, we would add a whole new level of understanding to the notion of entitlement reform. 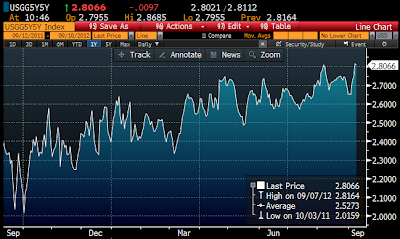 Swap spreads have been among the best leading indicators of the health of the economy that I know of. The swaps market is typically very liquid and populated mostly by large institutional investors, the sort that move $billions with a phone call. They are usually smart and well-informed, at least better-informed than the guy on the street. So when swap spreads change in a big way, it's because big money is sensing a big change in the underlying fundamentals. The big decline in swap spreads in late 2008 and early 2009 correctly foreshadowed the end of the recession some months later. The big decline in Eurozone swap spreads that we've seen this year is a sign that liquidity has returned, confidence in the banking system has returned, and that the risk of a systemic failure in the Eurozone has all but disappeared. (See my swap spread primer for more background) From that it follows that there is reason to think—even though the PIIGS have not yet implemented necessary fiscal reforms—that we've seen the worst for the Eurozone economy. Things could start improving well before year end at this rate. 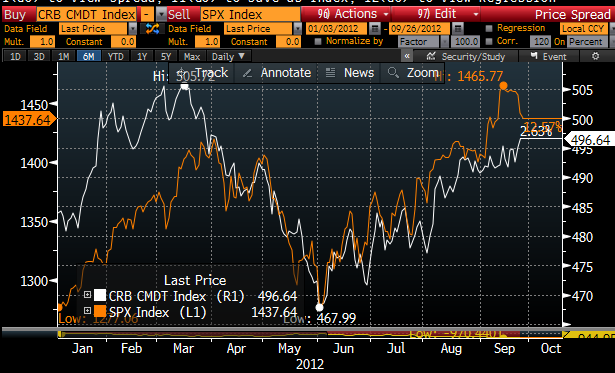 The equity market is beginning to figure this out. 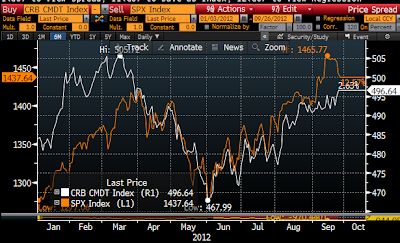 Since the big PIIGS scare of September 2011, the S&P 500 is up over 30%, and Eurozone equities are up over 25%. Governments don't fix economies, the private sector does—if given breathing room and time. The way I see it, the Fed and the ECB have supplied sufficient liquidity to restore financial markets to health. Liquidity allows big transactions to occur at lower cost, and it allows the market to resume its search for information (i.e., price discovery). Governments are no longer trying to "stimulate" their economies with debt-financed spending. Keynesian stimulus has been thoroughly debunked, and now it's only a matter of time before more sensible stimulus policies are put in place that could really get economies going. In the meantime, we are seeing the U.S. economy undergoing a very modest "organic" recovery that is being held back by powerful headwinds (e.g., the uncertainties surround the election and the looming fiscal cliff). Today's employment report was not encouraging at all—only 103K private sector jobs created, vs. the ADP estimate of 201K—but neither was it cause for increased concern over the health of the economy. The economy is still growing slowly, and it is still way below its growth potential. However, it remains the case that it is improving on the margin, and that is the most important thing at this point, because the market is priced to a deteriorating economy. You can see that in the S&P 500's forward PE ratio of 13.3, which is well below the long-term average PE: the market expects earnings, which are currently close to all-time record highs, to decline significantly. You can also see that in today's 1.6% 10-yr Treasury yield, which only makes sense if one has dismal expectations for future economic growth (think Japan). The market has been expecting another recession, and instead we're getting slow growth, and that's good news in a relative sense. A few things to note in the above chart of private sector employment: The big gap that opened up between the household and the establishment survey early this year has narrowed significantly. I thought there was a chance that the establishment survey could be telling us that the economy was doing much better than most realized, but now that hope has faded. Judging from these surveys, jobs have been growing at about a 1.2% annualized pace over the past six months, or about 110K per month on average. If the productivity of labor equals its long-run average of 2% per year, then the current pace of jobs growth will give us real growth in the economy of about 3% per year. That's about average, but it will never close the current output gap, which I estimate to be at least 12%. The economy is not going to improve enough before the November election to make a difference. The only reason the unemployment rate has come down is that there are more than 5 million people who have dropped out of the labor force since 2009. The public sector continues to shrink, but mostly at the state and local level. Mark Perry has some interesting numbers: "From January 2009 to August 2012, there has been a loss of 533,000 local government jobs, a loss of 149,000 state government jobs and a gain of 27,000 federal jobs." Today's economic data provided yet more evidence that the economy continues to gradually improve. More importantly, given that Treasury yields remain extremely low, there is no evidence at all that the economy is deteriorating. The market continues to expect terrible news, but the news keeps coming in better than expected. Thus, the equity market continues to rally even though the economy struggles with a decidedly sub-par recovery. Announced corporate layoffs are close to record lows. Corporate America is not panicking. The ADP jobs number was stronger than expected (201K vs. 140K) and once again it points to a stronger than expected payroll jobs number tomorrow (currently expected to be only 140K). Unemployment claims remain low. This chart shows the raw, nonseasonally adjusted data. Nothing bad at all about this that I can see. 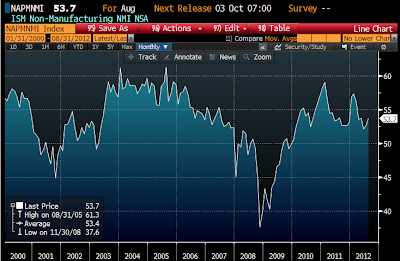 The ISM service sector report was also somewhat better than expectations. It's definitely not showing growth to be excited about, but neither is it deteriorating. When the market expects deterioration and the economy instead grows by only a modest amount, that is bullish. 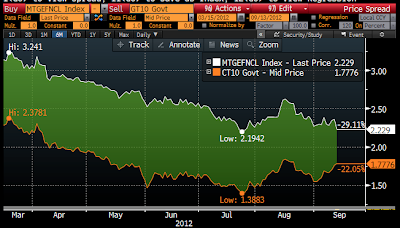 2-yr sovereign yields are a good indicator of the market's perceived risk of near-term default. By this measure, the near-term outlook for the Eurozone has improved rather dramatically this year. Yields for most of the PIIGS are still well above German yields, which means they aren't out of the woods yet. 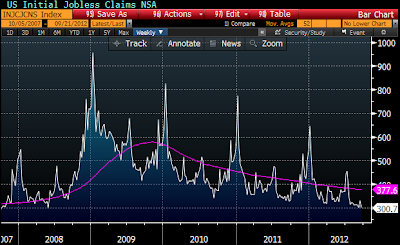 But the risk of default is much less today than it was near the end of last year. Much of the improvement can be traced to the ECB's provision of abundant liquidity to the Eurozone financial market. The reduction in the cost of obtaining dollar liquidity is also significant, as shown in the second chart above. Swap spreads in the Eurozone are still somewhat elevated, but at current levels they signal that market participants are pretty confident that Eurozone banks do not face an imminent crisis. Swap spreads reflect the market's confidence in the health of the financial system, and they also reflect a significant decline in Eurozone systemic risk. The reduction in swap spreads is the market's way of saying that liquidity is decent, that it is possible to trade, that investors and institutions can reduce or increase their risk exposure without much difficulty. When markets are liquid they can handle almost any problem, because those who are uncomfortable bearing too much risk can shift the risk to someone who is more able and willing to take on the risk. Is there anyone left in the world who is holding onto Spanish sovereign debt that doesn't want to? I doubt it. 5-yr Credit Default Swaps are a good indicator of the long-term perceived risk of default, and here too we see a lot of improvement. 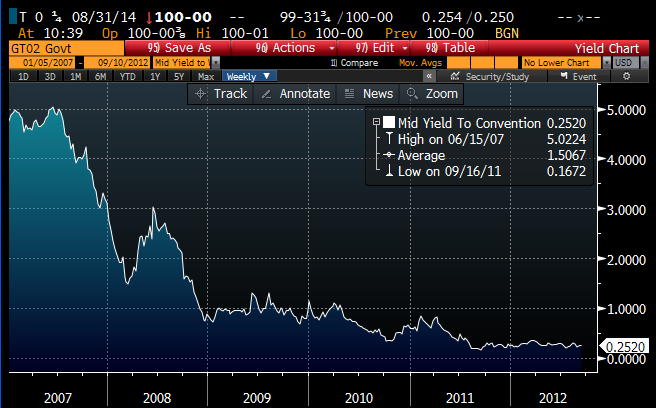 Most of the PIIGS now trade better than junk bonds, which means their risk of default is manageable and not very scary. Europe is still struggling, of course, but it's not going down a black hole, which is what markets were very worried about at the end of last year. Even though the reality in Europe is still grim—most countries are probably in a recession, and Spain is having some real problems—things are better than what markets feared, and that is what has put a floor under the Eurozone equity market. The outlook is still bad, but it's not as bad as what had been priced into markets. So on the margin, there has been some noticeable and welcome improvement. This is the same theme that is playing out in the U.S. The economy still stinks, but we are in far better shape than markets were expecting. Around the end of 2008, markets were priced to something like the end of the world as we know it. Credit spreads were so high than the bond market was effectively expecting that about one-third of the companies in the U.S. would be out of business by now. The market is still very worried about the future, only less so today than before. PE ratios are below average even though corporate profits are at record levels; that tells you that the market fully expects profits to deteriorate. Credit spreads are still somewhat elevated, which also suggests the market expects the outlook to deteriorate. Treasury yields are still extremely low, which tells you that investors are so worried about the risk of investing in anything else that they are willing to forego almost all of the extra yield available elsewhere.